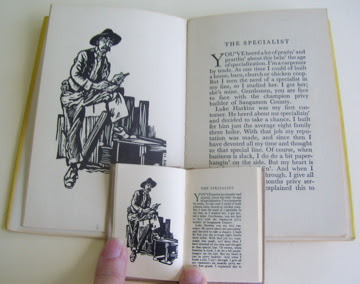 Don Brady (1926–2006) is one of the bibliophiles in my library. He was one of the bookies who, for many years, met for breakfast in New Port Richey, Florida on Friday mornings. My wife called them "bookies" because they all had something to do with books. Don was a printer and a bookbinder. Don's wife Mary still meets us for breakfast in New Port Richey, Florida on Friday mornings. 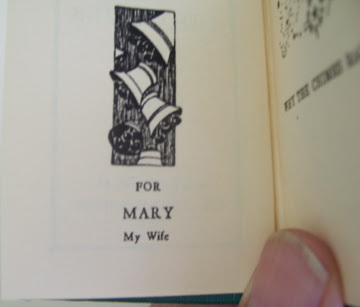 And recently she gave us some of the books Don owned: one large book and many smaller ones that he stored in boxes. The large book, The Vanishing Breed, by Don Brady, is the topic for My Sentimental Library blog post this month. And some of the smaller books are the topic of this here blog, specifically the very copies of books which Don Brady utilized to print his miniature books. 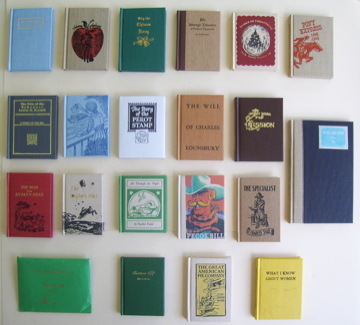 I call these books "mother books," a term Charlotte M. Smith used in her 1984 Books at Iowa essay, "The Joys of Miniature Books." 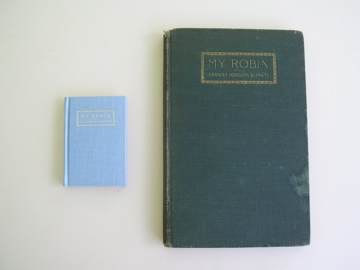 Below is an image of My Robin, published in 1993, and the mother book from whence it came: a 1912 edition published by Frederick A. Stokes Company. At first glance, it appears that both of these books are presentation copies from the author. But when I took a closer look at the presentation inscriptions, I discovered the inscriptions were identical. It seems that Don photographically reproduced a copy of the book. And it would be hard to tell which one has the original inscription! Here's a copy of The Will of Charles Lounsbury by Williston Fish, Clearview Press, 2001, now reunited with its mother book from whence it came: an undated Loring & Musey printing from the 1930s. 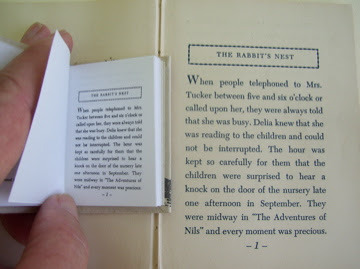 The Loring & Musey edition was printed in a french fold. And wouldn't you know that Don printed and bound his edition in a french fold as well! Here is the definition of french fold from Etherington and Roberts: a sheet of paper printed on one side only and folded over from left to right to form a "section" with uncut bolts. The inside of the fold is blank. Note to John Carter ABC for Book Collectors afficionados: Did Etherington and Roberts really write "uncut" instead of "unopened?" 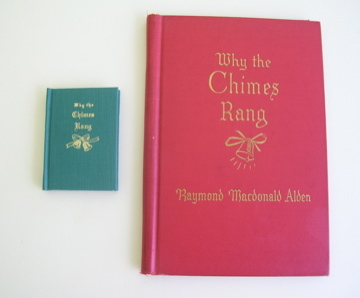 Here is a copy of Why the Chimes Rang by Raymond Macdonald Alden, Clearview Press, 2006, now with its mother book from whence it came: a 1934 reprint of a book first published in 1906 by the Bobbs-Merrill Company. Don photographically reduced the pages of this book as well. He set the type for his earlier books, but for his later ones, he used the photographic reduction process. Here's a copy of The Great American Pie Company by Ellis Parker Butler, Clearview Press, 2006. along with two mother books from whence it came: A.L. Burt reprints of a book first published in 1907. Don disbound one copy for use in the photographic reduction process. I'm surprised that Don didn't print Ellis Parker Butler's most famous book, Pigs is Pigs. And he had a copy of it. George Spiero, Don's friend for over 20 years, tells me that Pigs is Pigs was Don's favorite book. 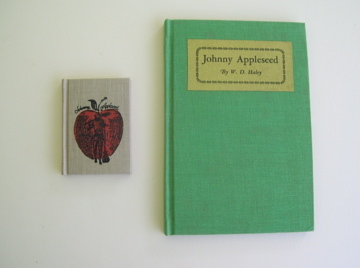 One book Don Brady published under the Clearview Press label technically isn't a miniature book because it is 4 11/16 inches tall. 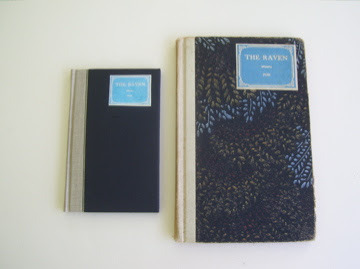 I'm talking about Don's edition of The Raven by Edgar Allen Poe. Don published 30 copies of it in 2001. And here it is with its mother book: an undated Grosset & Dunlap reprint. Don Brady was eighty years young when he died in December 2006. And by the looks of some of the books he owned, he planned on printing more than a few more. Below is an image of photographically reduced pages from The Story of the Other Wise Men by Henry Van Dyke. Don owned two mother books of this book. 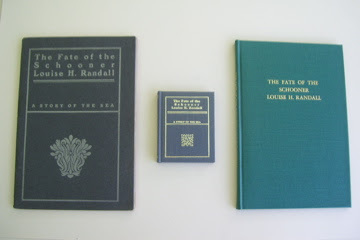 And I will discuss and display them and some of Don's other books in a Biblio Researching blog post in the near future. a series of articles to be published in The Microbibliophile, a bimonthly journal about miniature books and the book arts. My first article appears in the September 2013 issue.